End of Summer Camp Week is Next! Beach and Ocean Week has come and gone and boy, was it great! Read on below to learn all about the fun that was had and learning that took place! On Monday, the students crafted their first sea animal of the week – a fish! In order to do so, the students started by painting a regular paper plate which would later become the body of the fish. A quick snip of the scissors created a fish tail and a fish mouth! What beautiful fish were created! 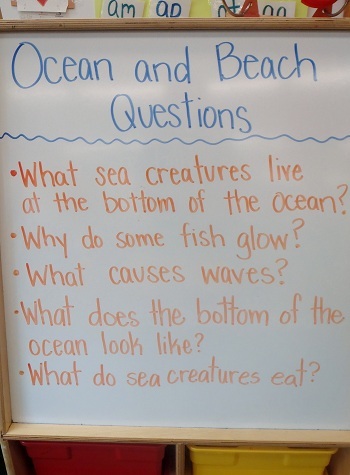 During the afternoon on Monday, the students created a list of questions that they wanted to explore all about life under the sea! Here is the list of questions that they came up with! Tuesday was a very exciting day at PPA – it was also CrAzY hAt DaY! The students proudly wore their CrAzY HaTs throughout the entire school day and even put on a CrAzY hAt DaY Parade to finish up the day! Look below to see some of the WaCkY and CrAzY hats that came in! On Wednesday, the students trekked down Central Avenue to the local landmark, Goehrig’s Bakery! Over 75 years old, Goehrig’s Bakery has been providing sweet treats to patrons of Jersey City, Hudson County and beyond! The students’ eyes widened as they entered the bakery and saw all of the delicious delicacies the bakery had to offer! After some deliberation, the students decided that chocolate chip cookies were a great choice and the order was placed! Needless to say, the cookies were enjoyed! Here are some of the photographic highlights from the trip! Thursday was another exciting day at PPA! The students, teachers, and some PPA parents spent the morning with some of Jersey City’s bravest Firefighters at the local Firehouse! The firefighters really pulled out all the stops for the PPA kids! Captain Mike Alessi and his firefighting team did a phenomenal job explaining the different ways to stay safe in a fire. The students learned about, discussed and practiced fire safety all morning long! As if climbing aboard a fire truck and spraying a fire hose wasn’t exciting enough, the students were in shock to learn that the firefighters had gifts to present to the students! Each student left the firehouse with a fire bag, a fire hat, a fire badge, a coloring book and crayons! The students were so appreciative of the firefighters hard work and generosity but they were not the only ones bearing gifts that day! Two lucky students were selected to present the firefighters with a special poster that was created by the students to express their gratitude for all the good and hard work they do for the community! Captain Mike was very appreciative of the students card and said that it would be hung up on the wall of the firehouse for all of the fire squads to see! Wow, a piece of PPA art will hang up in the firehouse! The students all agreed that this was very exciting news! What an amazing trip it was! Be sure to look below for some of the photographic highlights from the incredible and important field trip! During the afternoon on both Thursday and Friday, the students participated in a technology presentation all about the questions they came up with earlier in the week! Questions and topics explored included: “Why do some fish glow?” and “What sea creatures live at the bottom of the ocean?” The students were so fascinated to see actual video footage from the the ocean like this one below! On Friday, the students of PPA were visited by a very special PPA Mommy named Star! Star came to PPA to explain her job as an artist. Star explained that most of the art she creates is abstract photography including sun prints and photo-grams. Star began the day by explaining what a sun print is; the excitement grew when the students learned that they would be making their own later that morning! Star led the students outside to the park to get started. Using little toys and foam sea animal shapes, the students began the sun printing process! Take a look below to see the students and Star in action. What an amazing art project! A special PPA Thank You to all of the PPA parents, local businesses, and community helpers that were such an integral part this past week! Your time and efforts are appreciated more than you realize! Well, that is all for this week of camp. Be sure to check back next week as we wrap up the 2012 PPA Summer Camp! As always, thank you for reading. Have a fun and safe weekend! Monday – WATER PARK and Craft DAY! Tuesday – WATER PARK and Craft DAY! Wednesday – E.M.T. Tom and Jersey City E.M.S. Visits PPA! Thursday – Turtle Back Zoo Bus Trip! All students must wear the camp shirt and pack a completely disposable lunch today! The bus will depart at 9:00 a.m. and return at 1:30 p.m.
Parents welcome to attend – don’t forget to pack a lunch, if so! Please notify Miss Justine if you plan to attend! ALL STUDENTS/FAMILIES (regardless of enrollment schedule) are encouraged to attend! Students who do not attend school on Friday should arrive to the park at noon. Pizza, snacks and beverages will be served shortly after 12:00 p.m.
Camp ends at 1:30 p.m. – Aftercare is not available on Friday. Click here to view all of the photographs from Beach and Ocean Week!